The cat finally ran screeching out of the bag last night, as American Horror Story Season 6 finally revealed its mystery theme as … well, they didn’t really give it a succinct name, but welcome to “My Roanoke Nightmare”! And with the revelation, comes our first proper trailer for the season, introducing a few returning favorites in the creepy new footage. 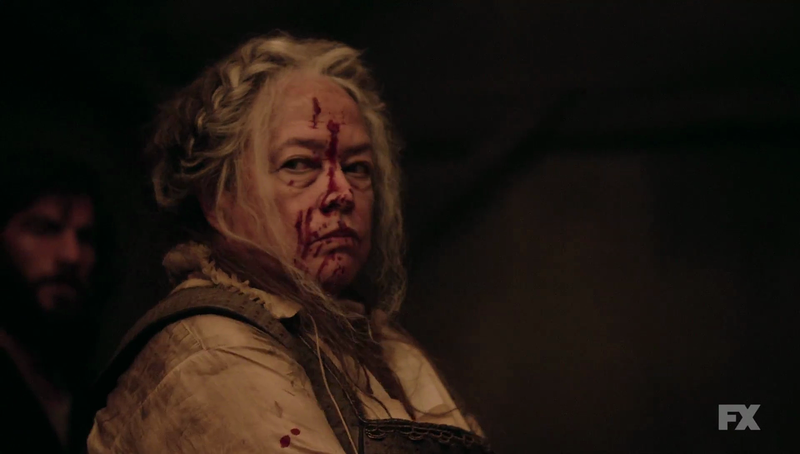 Where last night’s premiere only featured the mysterious woods-folk in brief shots, the latest Season 6 trailer confirms Kathy Bates as a leader in their ranks, and as crazily-accented as we’ve come to expect from the actor. It looks as if Denis O’Hare will play an earlier tenant of the house, while Wes Bentley is visible in certain shots as well. In case anyone had wondered, the trailer also confirms we’ll be sticking with the meta “My Roanoke Nightmare” format, rather than changing up different documentary horrors in each episode. There’s plenty to unravel as we move through the sixth season (is it My Roanoke Nightmare: A True American Horror Story? ), but see for yourself in the footage above. “Chapter 2” will air next Wednesday on FX at 10:00 P.M.